How has Venezuela’s foreign policy changed in the 21st century? With the recent uproar surrounding President Obama’s executive order declaring Venezuela a national security threat, it is worth reading up on how this Latin American country has changed since the end of the 20th century. This excerpt from Venezuela: What Everyone Needs to Know by Michael Tinker Salas examines the impact of the election of Hugo Chávez on Venezuelan politics. How did the election of Chávez transform foreign relations? Having functioned largely in the US political sphere of influence for most of the twentieth century, Venezuela sought to chart its own course in international affairs after the election of 1998. Since 1999, the Venezuelan government has pursued new foreign policy initiatives, advanced the idea of a multipo­lar world, assumed a greater role on the international stage, and promoted hemispheric integration. These positions clashed with long-held assumptions about the nature of Venezuela’s relations with the world. Critics contended that many sectors in society conflated the oil economy with their own sense of nationalism; the oil economy—with the bulk of Venezuela’s production destined for US markets—necessitated good rela­tions with Washington. Efforts to alter how the nation conducted its foreign affairs heightened tensions between the government and a con­servative opposition. Venezuelan relations with the United States did not solely concern the nature of international relations; it also embodied important cultural and social symbolism. For upper- and middle-class sectors of society, relations with the United States expressed acceptance of a way of life, defined largely by US values, which served to affirm their own social standing. By not favoring relations with the United States, the Venezuelan government no lon­ger legitimated and promoted these perceptions, but rather became a vocal critic of this lifestyle. The changing nature of the relationship also raised concerns in Washington, long accustomed to having Venezuela follow US initiatives in for­eign affairs. The constitution of 1999 outlined the objectives of Venezuela’s new foreign policy. Besides traditional pronounce­ments about the country’s sovereignty in international mat­ters and nonintervention, it explicitly promoted policies that favored the integration of Latin America and the Caribbean, with the goal of “creating a community of nations that would defend the economic, social, cultural, political, and environ­mental interests of the region.” In addition, Venezuela refused to be party to any international agreement that recognized the authority of a supra-national judicial body to resolve disputes, a direct reference to treaties with international lend­ing institutions such as the International Monetary Fund or the World Bank. Guided by the proposition of a multipolar world, the Venezuelan government sought to establish equitable rela­tions in a post-Cold War era. It affirmed Latin America’s role on the world stage and used this approach to prevent the isolation experienced by previous leftist governments such as Guatemala in the 1950s and Cuba in the 1960s. Hoping to strike a balance in its international affairs, Caracas endorsed economic arrangements with China, Cuba, Iran, and Russia, especially in areas such as health, telecommunications, auto manufacturing, oil explorations, and the production of machinery. The Chinese constructed and launched into space Venezuela’s two orbiting telecommunication satellites. Iran operates a tractor and car factory in the country and the Russians have become one of the leading arms suppliers of the Venezuelan military. In the United Nations, Venezuela has openly sought the revolving position in the United Nations Security Council. As part of a policy to promote South-South relations, the country expanded diplomatic relations with most countries in Africa and in 2009 hosted the Africa-South America summit. In the first decade of the 21st century, the Venezuelan gov­ernment became one of the most fervent critics of Washington’s sponsored Free Trade Area of the Americas (FTAA), assert­ing that it would heighten and institutionalize inequalities already present in economic relations between Latin America and the United States. As evidence, critics of the FTAA pointed to the convulsions evident in Mexico after it signed a similar agreement: the devastation of its rural sector, the outmigra­tion of millions, and the monopolization of the economy by a handful of families. By 2005, Venezuela’s position on the FTAA increasingly found support among a majority of South American nations. Image Credit: “Canción patriótica” by Cristóbal Alvarado Minic. CC BY 2.0 via Flickr. Miguel Tinker Salas is Farmer Chair in Latin American History and Professor of History and Chicano/a Studies at Pomona College. 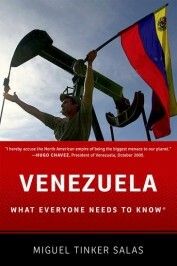 He is the author of The Enduring Legacy: Oil, Culture and Society in Venezuela and Venezuela: What Everyone Needs to Know.